UHDBits is an HD/BluRay tracker. The tracker is 5 years old and started out slow but now has become one of the most elite trackers out here today. They also have internal encoders: DON, HDVN, KASHMiR, PIS, PRiMaLHD, TayTO, UHDRemux (DKT, EEEEE, HaB, KHu, LDX, LiquidHD, TCO, VoLT). They have a bonus system were you can purchase from 10GBs to 500GBs of uploads, invites, and freeleech tokens. They have a hugh section of freeleech torrents which makes the site easier to seed and meet your ratio goal. They recently started a User Release forum this year for anyone interested in encoding. They currently have a maximum of 10,000 users and 7,264 enabled users. 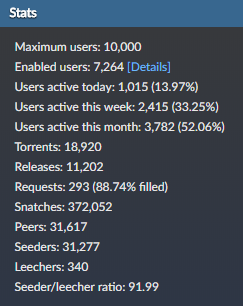 They currently have 18,888 torrents and 11,182 Releases. I believe this tracker is one of the better ones out there where you can find a variety of torrents and even music. You don't have to be an uploader to upload torrents on the site you just have to be promoted to power user or higher to upload torrents. They have also started adding 4K movies which can't do anything but improve the site even more. TheTrader, YusukeUramesh, CtrlShift and 14 others like this. UHDBits's pretimes are getting better. I think pretimes 5/10 so underestimated! captainX, Rud3dog and CtrlShift like this. This is an awesome tracker. I believe it's run by one of the guys who encode for HDBits, so they get lots of releases from there as well. I really like the UI as it's very clean categorizes by movie (top-level) and resolution, group, etc(sub-level). Pretimes are really good as well. Download speeds are blazing fast. One of the elite trackers for sure. Highly recommend it. TheTrader, jimmy7 and zhanglin like this. Your belief is accurate. It's home of TayTO and some encoders from DON, Geek,... You will also see many HDBits and UHDBits exclusive encodes, and many more... Its community is not very active but it's not dead. TheTrader and captainX like this. Great tracker! Have joined recently and i'm amazed. Great interface,well organised and quality releases with the new additions being free. Recommend it for sure! Agreed, can't say enough but high quality encodes here for sure, clean interface and design.